Jewelry Days.com Official Blog: A spectacular view of the Perseid Meteor shower tonight! A spectacular view of the Perseid Meteor shower tonight! The sky is falling on the world tonight! 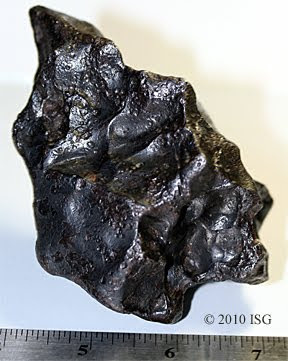 OK, not really the sky, but little bits of it far smaller than this iron-nickel meteorite shown at left. This 1.5 kilo chunk of a star fell in 1947 over the skies of eastern Siberia, and now resides in the ISG Student Reference Collection of StudyGems and Minerals. That event showered over 23 tons of meteorite material over the area providing some of the finest specimens of star stuff found anywhere on earth. Tonight is a bit less risky for all of you star gazers out there as the earth will pass through the path of comet Swift-Tuttle that left a tail stream of tiny pebbles, ice and dust that will rain down on earth as the annual Perseid Meteor Shower.